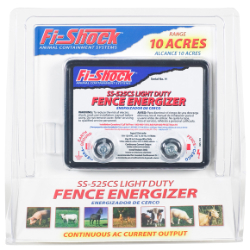 This charger can be used for electric fence containment of pigs, cattle, horses, deer, cows, sheep, and goats. A high-power electric fence charger, features a continuous AC current output and weather resistant cabinet to protect the circuitry of the charger (however, there are exposed connectors that should not become wet since that can potentially short out the units). The range for this low-cost charger is 10 acres.